Delectable French baked pastries right here in Laguna! But, read this BEFORE you go there! Jean Pauls Goodies makes extraordinary pastries! It doesn’t really matter what you order at this Laguna Beach bakery… it’s going to taste amazing! However, the owner is very French and extremely serious about the art of baking pastries! Jean Paul makes the pastries exactly the way they’re "supposed" to be made. He’s not going to change them, add this, cut that or take any requests- because someone else thinks it sounds good… so don’t ask. On that same note- if its not in the display case, he probably didn't make it, doesn't make it, or won't make it. Again, save yourself the trouble... don't ask. More importantly, several people have had the unpleasant experience of finishing their shopping at the Pavilions next door, purchased a Starbucks, and then walked into his bakery for a pastry. This usually results in him stopping whatever it is that he’s doing instantly and yelling “You have coffee, get out!” Yes, he’s serious. Yes, he’s kicking this person out of the shop. Now that you know, hopefully I’ve helped you avoid that uncomfortable situation entirely. In spite of this quirk, the pastries are amazing and worth stopping by! Not long ago, Michelle and I made a special trip to this little shop because she had never been there! As usual, the shelves were loaded with incredible French pastries! I made sure to warn her to order only what we could see in the display! 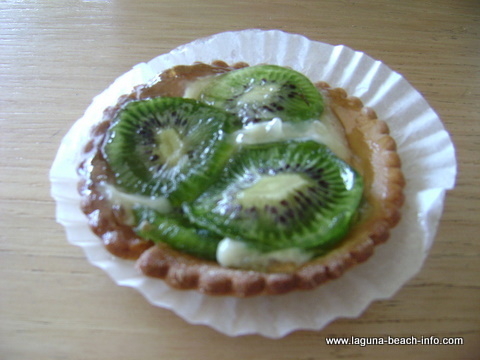 (Kiwi Fruit Tart) Michelle picked the kiwi fruit tart and since I was determined not to leave without some kind of chocolate- I opted for the chocolate eclair. As usual, Jean Paul creates visual works of art! They were so artistically crafted I felt a little bad biting in... and then I tasted how incredible they were! The pastries at Jean Pauls Goodies are well worth stepping lightly around the intensity of the owner. Stop by, you won’t regret it! A final note: just like the pastries, the coffees come exactly as they are posted... and in one size only. Don't worry about how your local barista taught you how to order it with the double-half-caff-no-foam-three-pump-whatever... cuz that's not going to go over very well here. A final final note: if you go in and speak French with him, your likely to instantly improve the owner's charming persona!! Free parking in front of the shop, and at the Pavilions shopping center next door. Share Your Jean Pauls Goodies Experience or Review! 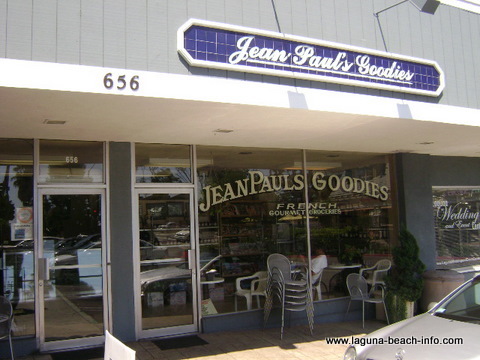 Do you have a great story, experience, or photos from Jean Pauls Goodies? Share your stories, reviews, and pictures from this Laguna Beach bakery here!